SANTINI - L'Amérique divisée en ses principaux Etats. . .
SANTINI, P. / REMONDINI, M. - L'Amérique divisée en ses principaux Etats. . .
L'Amérique divisée en ses principaux Etats. . . - SANTINI, P. / REMONDINI, M.
Title : L'Amérique divisée en ses principaux Etats. . .. Size : 18.3 x 25.2 inches. / 46.4 x 64.0 cm. 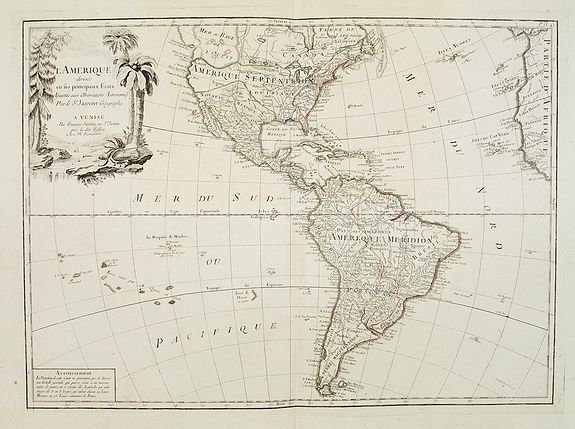 Description :Uncommon map of the American continent after Janvier's, to whom Santini gives credit in the cartouche. This map is most notable for it's depiction of "Mer ou Baye de L'Ouest" or "Sea of the West". A great sea, easily the size of the Mediterranean, to flow from the then-known Strait of Juan de Fuca. Showing an opening to the ocean from this great sea at roughly in North California or Oregon. Listing Indian nations, towns such as Santa Fe. Condition : Close to mint condition.